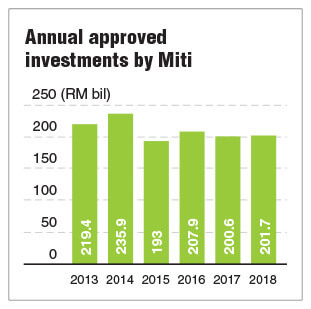 KUALA LUMPUR: Given the challenging economic conditions before us, the Ministry of International Trade and Industry (Miti) has set a “realistic” target of RM200 billion for approved investments in 2019. Malaysia’s approved investments only increased 0.55% to RM201.7 billion last year compared with from RM200.6 billion in 2017. The target may well imply that the country’s private investment will remain stagnant at near RM200 billion-level for the third consecutive year. Miti minister Datuk Darell Leiking attributed the minimal growth to a 17% decline in domestic direct investments (DDIs). Notably, the overall foreign direct investments (FDIs) surged 48% to RM80.5 billion last year, from RM54.4 billion in 2017, to account for nearly 40% of the pie. The DDIs, meanwhile, fell 17% to RM121.2 billion, from RM146.2 billion in 2017, shrinking the DDIs’ share of the pie to 60.1%, from 72.9% previously. However, he did not elaborate on the cause of the lacklustre private investments in the country. Speaking at the Malaysian Investment Development Authority’s (Mida) annual media conference yesterday, Leiking said more investments were approved during the second half of 2018, at RM115.6 billion, compared with the period of January to June 2018 valued at RM86.1 billion. ”We will continue focusing on the manufacturing of electrical and electronics, which is something that has contributed a lot to our investments, aerospace, chemical and chemical-related manufacturing, and many more. “But we should not forget about agriculture as well. I know some may not think that it is still viable, (but) we need to ensure that agriculture, which was our expertise at one time, continues,” said Leiking. The approved RM201.7 billion worth of investments came from 4,887 projects which are expected to create over 129,700 job opportunities. Of the total RM201.7 billion, the manufacturing sector contributed RM87.4 billion, up 37.2% from RM63.7 billion in 2017, as new projects attracted higher levels of foreign investments. Leiking said foreign investments in approved manufacturing projects have more than doubled to RM58 billion in 2018, from 2017’s RM21.6 billion. Foreign investments constituted 66.4% of the total approved investments in the manufacturing sector. China was the largest investor at RM19.7 billion, followed by Indonesia (RM9 billion), the Netherlands (RM8.3 billion), Japan (RM4.1 billion) and the US (RM3.2 billion). The services sector, meanwhile, was the largest contributor to the total approved investments, amounting to RM103.4 billion from 4,103 projects, mostly from domestic investments. The balance of RM10.9 billion was invested in the primary sector last year. This amount stood 12.2% lower compared with RM12.4 billion in 2017, largely due to lower investments in oil and gas exploration activities under the mining sub-sector.